The new paradigm of pervasive computing was born from the needs of highly mobile workers to access and transfer data while on the go. Significant advances in the technology have lent and will continue to lend prevalence to its useespecially in m-commerce. Covering both mobile data and sensor data, this comprehensive text offers updated research on sensor technology, data stream processing, mobile database security, and contextual processing. Packed with cases studies, exercises, and examples, Fundamentals of Pervasive Information Management Systems covers essential aspects of wireless communication and provides a thorough discussion about managing information on mobile database systems (MDS). It addresses the integration of web and workflow with mobile computing and looks at the current state of research. 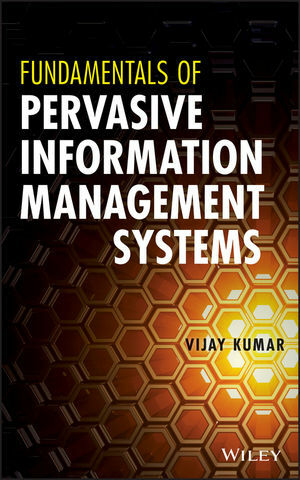 Fundamentals of Pervasive Information Management Systems is an ideal book for researchers, teachers, and graduate students of mobile computing. The book may also be used as a reference text for researchers or managers. VIJAY KUMAR, PhD, is Professor of Computer Science in the department of Computer Science Electrical Engineering at the University of MissouriKansas City. Dr. Kumar has served as a consultant to the United Nations and is on the editorial review board of several peer-reviewed journals. He is the editor-in-chief of two peer-reviewed journals: International Journal of Next Generation Computing (IJNGC) and International Journal of Computer Science (IJCS). His research interests include recovery and security in mobile database systems, workflow on the web, mobile computing databases, data warehousing, and web security.